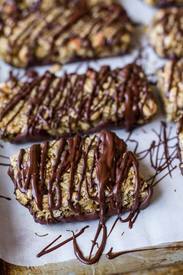 Chocolate dipped zucchini granola bars! These bars couldn’t be a better representation of summer. I mean, I did stuff them with plenty of garden fresh zucchini. Zucchini in the bars? Well, you can’t really see the zucchini, but it’s there. It’s actually good you can’t really see it because then the people who fear anything green don’t run screaming. To make things even better, the granola bars get dipped in a little chocolate. Ok, a lot of chocolate. Chocolate is the perfect little pick me up.